Happy Cinco de Mayo! I know, I know.. It's more of a holiday that we've chosen to adopt, but who doesn't love the chance to gather with friends over Mexican food and drink ?! After my first trip to Cabo, in March, I'm still thinking about the amazing hospitality I received and the country's love for Tequila! 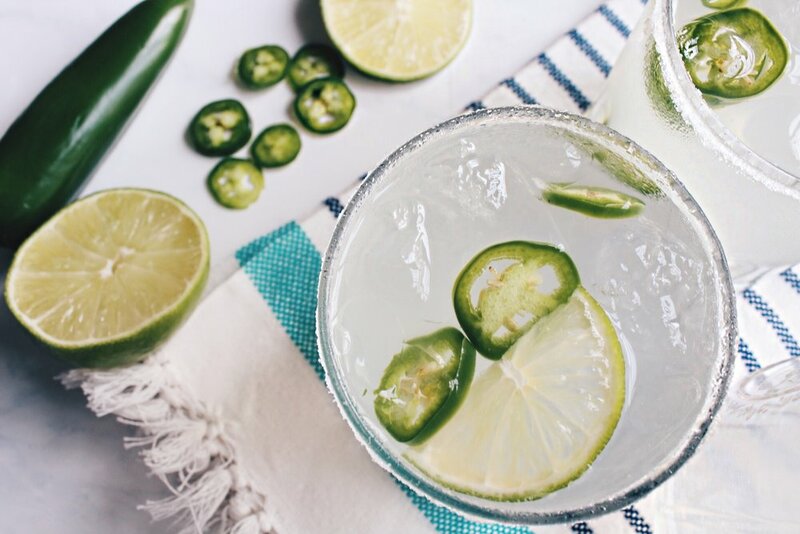 "I can still taste those 10 samples of Tequila, from the tequila tasting .... "
Although I could probably Mexican food 3-5 days out of week, I've decided to forego the guacamole or street taco recipe, this year and share one of my favorite margarita recipes, "A Spicy Sparkling Margarita". This drink is the best of both worlds because it combines two of my favorite things, spice and sparkle ! Pour all ingredients in shaker and shake well. Spread the sugar evenly onto a plate. Use one of the squeezed lime wedges to moisten the rim of your glasses. Then, place the glass upside down into the plate of sugar, making sure that the rim of the glass is coated with the sugar ( twist the glasses around in the sugar a few times to give a thicker sugar rim). Place additional limes in each glass.